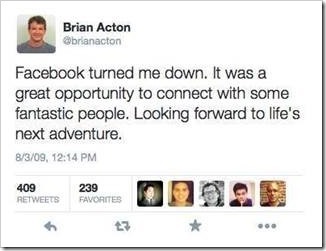 He, along with his friend Jan Koum starts WhatsApp, and today, Facebook acquired them for $19 billion. The technological and startup world is stunned by this Silicon Valley mega-deal. $19 billion for a mobile app, which has no revenue model as of now! The biggest threat which Facebook is experiencing today is decline of its usage among teenagers. More and more teenagers from US and Europe are using mobile chat apps for everything they used Facebook for earlier. Besides WhatsApp, there is SnapChat, WeChat, Line, Telegram and other popular applications which have suddenly become very popular among the young, restless crowd. And any technologist will confirm that it is these young teenagers who are the real harbingers of change – they are the first to adopt a new technology, and the first to try out new things. Youth consumers make up $200 billion market in the USA, and investors and shareholders are aware of this figure. By acquiring WhatsApp, Facebook has placed a “bet in the future”. They will now have access to more teenagers and more youth than it ever had. A very solid reason to consider, if I was a shareholder in Facebook. WhatsApp has a uniformed, global reach. 1 million downloads are happening every 24 hours, and majority of them are new users from Asia and Africa. Facebook needs a global reach to further expand their influence, and what better mechanism than to acquire a company which is has 450 million+ users, spread all over the world! While announcing last quarter’s results, Mark Zuckerberg had famously said that they are now a “Mobile Company”. Over 50% of users access Facebook via mobile now, and in some countries like Sweden, this figure goes up to 80%. 53% of revenues generate via mobile platform for them. Facebook is desperately trying to reinvent its platform so that more mobile centric features are embedded and more mobile users access them. In this sense, acquisition of Facebook makes perfect sense. They have now an audience which uses mobile more than anything else! 500 million photos are shared on WhatsApp everyday, whereas only 350 million images are crossing hands on Facebook! We tend to forget that the reason Facebook paid $1 billion to acquire Instagram was to control images. Snapchat is growing stronger every day as well, with 400 million images & videos (called snaps) being shared every day. This is definitely a matter of concern for Mark, as he wants to dominate the images market. And in this sense, WhatsApp purchase makes perfect sense. Now, we are coming to the final factor: the Holy Grail of all Internet/Mobile based monetization methods – Advertisements. Facebook and its investors know that advertisements bring dollars. Insane dollars such as Google makes a fortune churning out $12 billion a year selling advertisements. Now, with WhatsApp acquisition, Facebook has a treasure full of data which can be used to further streamline advertisement network and bring in more cash. Imagine a scenario where Facebook is able to read and analyze that a couple of friends are making plans to buy pizza this afternoon. Everything is possible after that in terms of ‘laser-targeted’ advertisement is concerned. Who knows, Pizza Hut guys can directly give a call to these guys who have just shared that they want to have a pizza on WhatsApp. These are just the possibilities which have been speculated, regarding the acquisition of WhatsApp by Facebook. If you have your own theory, then do share them by commenting right here! 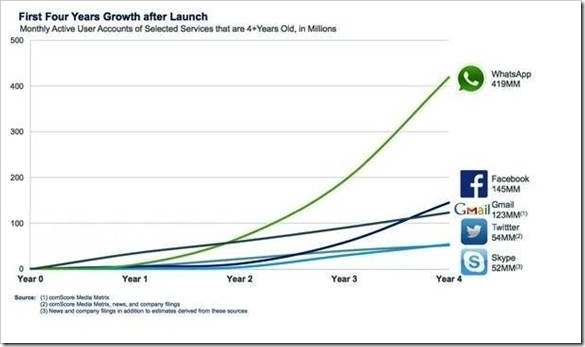 "5 Reasons Facebook Acquired WhatsApp For $19B", 5 out of 5 based on 1 ratings. Now, Have Election Talks With NaMo, Kejriwal On Facebook Talks! Android App to Answer Bengal Farmers’ Questions! Next 10 years is only a conversion to web to mobile. Google and Facebook are competing very hard for mobile market share and BIG DATA, more importantly. Interestingly WhatsApp have both in it. Hearing of the update that Facebook has acquired Whatsapp came at no surprise but the amount involved was indeed mouth-watering. Kudos to Brian, The rock the builders rejected has now become the cornerstone. All your reasons are upto the mark, i also think the same. Whatsapp is a mobile legend than Facebook, Facebook buys its competitor. I think Line/wechat will soon be acquired by Google now. As Google competing with facebook from long time. Wow! Amazing speculations, Mohul. Here in Hungary, we all are trying to think hard, what makes a mobile app go viral. Your insights and opinions are very very practical. Thanks for sharing them with us. High 5! Marks post on facebook suggests that he wants to continue following the current product roadmap for Whats App, which the original founders believed was to have a messaging experience sans ads. It’s left to be seen whether Facebook would continue providing that experience. Or like you mentioned, they could make it so contextual and targeted where advertisements could be served based on your needs. In any case, facebook now has access to a larger share of information. So it’s left to be seen how they use that to justify the dollars spent on the acquisition. But all in all, WOW!! !